Few names draw the kind of water that Bugatti does. And in the lore of the marque, few models elicit the kind of reaction that the Atlantic does. So when the Alsatian automaker brings it up again, we sit up and pay attention. And that's just what's been coming out of Molsheim lately, 80 years since the iconic model's debut. While the Type 57 was (and remains) the most prolific model line Bugatti ever produced (with some 800 made), the Atlantic remains the most coveted, with only four made and three sold to private customers. Of those three, two have won Best of Show at the Pebble Beach Concours d'Elegance. One is famously owned by fashion icon Ralph Lauren. And the last one to have traded hands is thought to have sold for over $30 million to renowned collector Peter Mullin, which gives you an idea of how much they're worth. 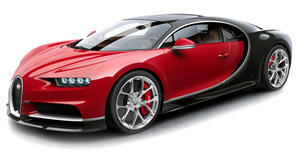 Some experts believe Bugatti sold it to one its early racing drivers. Others think it was seized when Nazi Germany invaded France and reoccupied Alsace. Now decades later, the automaker recently released retrospective on the model (along with a series of videos on Facebook). And its timing has bread speculation that it could have something in the works for the Geneva Motor Show, where it's expected to unveil a one-off, $18 million set of wheels. Could it have found Jean Bugatti's long-lost Atlantic? Or has it worked up some kind of modern tribute? Suffice it to say, we'll be watching.